PokéAPI, the REST API for Pokémon, is a project I started in October 2013 with the intention of demonstrating good RESTful practices. In the space of 48 hours I built a really hacky application and stuck it online on a tiny little Digital Ocean droplet. Because of the data it was providing, it gained popularity very quickly. There are hundreds of websites about Pokémon but none of the data they had was consumable through an API. The weekend after I launched the project, I spent all my time learning about caching, distribution, and how to handle heavy traffic. I did not expect the application to get so popular. It was a pretty hectic time. It was fun. @phalt_ @PokeAPI It's a great example of how if data is there, people will use it. I think Chad has a really good point: No matter the data, even if it’s only usable by 2 or 3 people someone will consume it. It’s an idea I’ve thought about for a long time and it is nice to see friends who I hold in high regard thinking of the same thing. 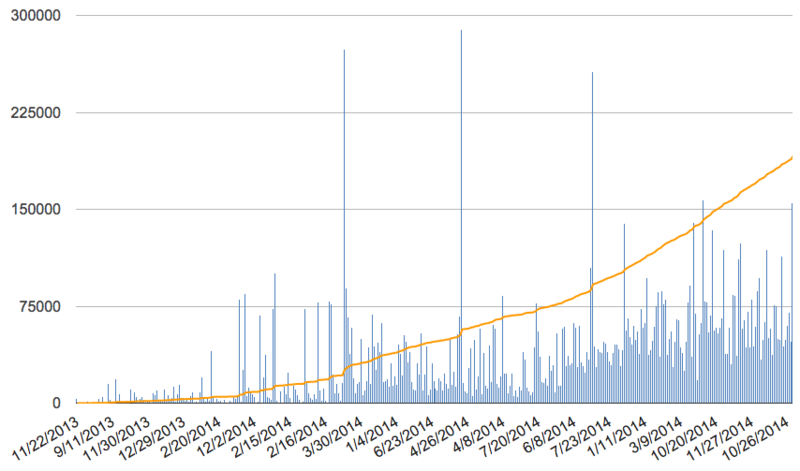 Since October 2013 PokéAPI has served over 13.5 million API requests, averaging 35 thousand API calls a day. It has been the source of a number of cool applications and has even been used in school lessons to help teach APIs. I really wish this wasn’t a joke: some days, people on the internet made nearly 300,000 requests for data about Pokémon. Now, I have a confession: I never planned to build something that would be used so much. Because of this I’ve negelected the project and left out quite a lot of data. For example, generation 6 Pokémon (there have been that many) don’t have any attributes at all. I never planned to set any time aside for adding new content and I’ve had hundreds of personal emails asking me to update it. I feel awful for neglecting what is obviously a beloved and fun API. Putting all the source code online. Building a 100% Test Coverage test suite. Building a new version of the API under api/v2/ that will have some slightly reformatted data and new resources. Using Veekun’s Pokedex GitHub data for V2 of the API with data models that map closely to their database. Deprecation of the V1 API in January 2015. Content update to support the latest release of games. Deprecating the V1 API will mean that no more data or changes will be made to it as of January 1st 2015. It will be put into a stable state and after that no more content or data will be added to it. Instead, all new development and new data will be added to the V2 API. From January 2015 an extra HTTP Header will be in the responses from the API recommending people upgrade. The project can be forked on GitHub right now. If you want to contribute, look at the extensive list of issues that I have addressed there are a tonne that I need help on. This will help me keep the server up and running which so far I’ve been paying for out of my own pocket. I am also leaving my current role at Twilio to pursue more technical roles, so I can dedicate every day to this if I can afford to. The Star Wars API will provide a RESTful API for Planets, People, Starships, Vehicles, Species and Films from the six major Star Wars films. Why just these films? There is much dispute about canon and I believe George Lucas recently said that the major films would be considered cannon. To avoid data clashes and weird hacks to make things match up properly, I’ll just keep it to the major films. For now. It should be a pretty fun API to build as no easily formatted data for this data exists yet. I might end up scraping Wookiepedia or just watching the films over and over to get the right content. Want to help out? You can sign up to get early access to the API which will be coming in the next few months. I’d love some support so email me if you want to gather data for me or help me build the API. 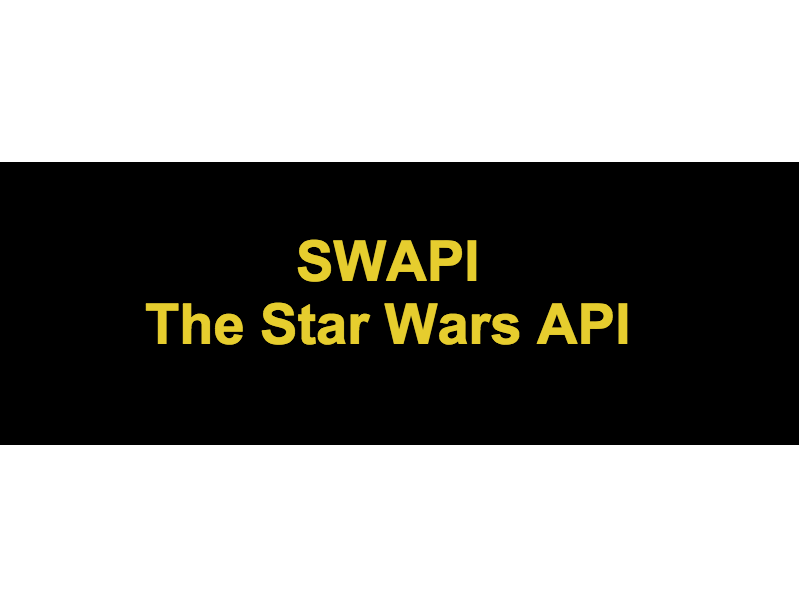 And yes: SWAPI will include data from Star Wars episode VII: The Force Awakens once I or my other data gatherers can get valid information on it. Here’s to the next six weeks! © 2019 Paul Hallett. Powered by Hugo using the Basics theme.